I recently wrote about the Indo-European Corded Ware Theory of Kristian Kristiansen and his workgroup, a sort of “Danish school”, whose aim is to prove a direct, long-lasting interaction between the North Pontic steppe and east European cultures during the Late Neolithic, which supposedly gave rise to a Late Indo-European-speaking Corded Ware culture. That is, a sort of renewed Kurgan model; or, more exactly, Kurgan models, since there is no single one preferred right now. David Anthony had remained more or less in the background after the controversial assessment of the so-called Yamnaya ancestral component by recent genetic papers, which posited that there was a genetic flow in the Late Neolithic suggesting a migration model that could be hypothetically simplified to Yamna -> Corded Ware -> Bell Beaker. 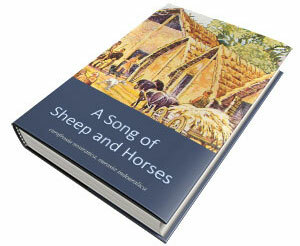 With his previous publications, especially The Horse, the Wheel, and Language: How Bronze-Age Riders from the Eurasian Steppes Shaped the Modern World (and its revisions), Anthony had set up an impressive revised steppe theory that overcame some of the errors of Gimbutas’ Kurgan model. Whereas Indo-European-speaking Corded Ware cultures (CWC) were still featured prominently in his model, the different languages supposedly spoken by these groups were explained through multiple cultural diffusion events, and actual migrations from Yamna peoples were only described into Early Bronze Age cultures of the Balkans, and into the Afanasevo culture. More recently, he has offered (in collaboration with his wife, Dorcas R. Brown) a tentative original connection Yamna -> Corded Ware in the Lesser Poland region, in their paper Molecular archaeology and Indo-European linguistics: Impressions from new data. It seemed to be based merely on recent genetic finds, and on the fact that Corded Ware remains appear to be oldest in that region, according to radiocarbon analysis. Now he seems to be more and more supportive of this hypothesis in his new essay, Archaeology and Language: Why Archaeologists Care About the Indo-European Problem, in European Archaeology as Anthropology: Essays in Memory of Bernard Wailes ed by P.J. Crabtree and P. Bogucki (2017). The chapter is interesting to read, as always. 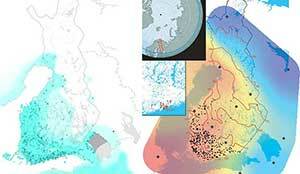 Nevertheless, it commits to previous errors – driven by the wrong interpretation of recent genetic papers -, and deepens thus this untenable archaeological-linguistic model of migrations from the steppe, in a weird vicious circle of wrong feedback between archaeologists and geneticists that diregards what archaeologists have been saying in the last decade. Instead of waiting for the current storm of genetic papers (and their misinformation) to pass, and see what remains, Anthony is now supporting a different model than the one that made him popular, risking the good name he has earned in Archaeology and in popular science texts – in spite of initial setbacks due to the prevailing criticisms of Indo-European migration models. Central and Eastern Europe ca. 3000–2500 BCE showing the early Yamnaya culture area 3300–2700 BCE and the Yamnaya migration up the Danube Valley with related/offshoot Makó and Vučedol sites; also the distribution of Corded Ware sites in northern Europe; and site areas sampled for aDNA in Haak et al. (2015). 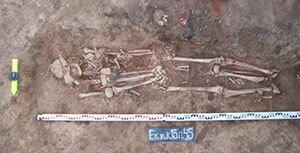 The oldest Corded Ware radiocarbon dates are from southern and central Poland. 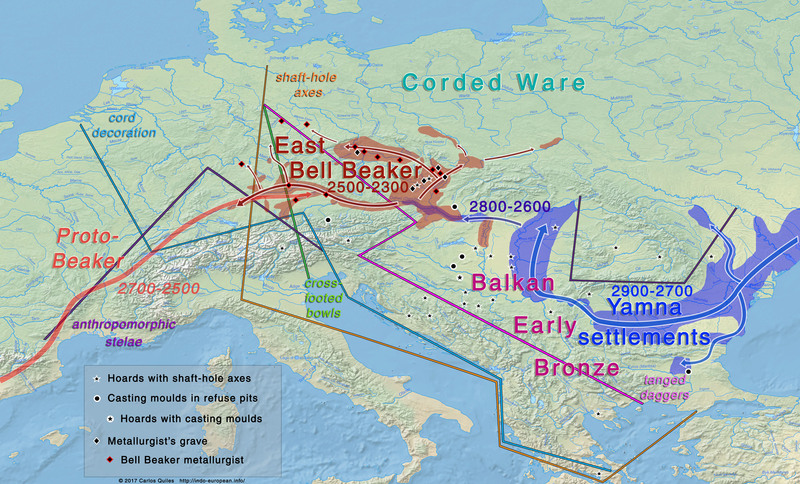 The Yamnaya cemeteries in the Danube Valley are after Heyd (2011), the shaded Globular Amphorae site area is after Harrison and Heyd (2007); the Corded Ware and Globular Amphorae sites in southern Poland are after Machnik (1999); and the blue dots were all Corded Ware sites with radiocarbon dates as of Furholt (2003). A Yamnaya migration from the steppes up the Danube valley as far as Hungary was already accepted by many archaeologists (Fig. 2.2). Hundreds of Yamnaya-type kurgans and dozens of cemeteries have been recognized by archaeologists in the lower Danube valley, in Bulgaria and Romania; and in the middle Danube valley, in eastern Hungary, with radiocarbon dates that began about 3000–2800 BCE and extended to about 2700–2600 BCE (Ecsedy 1979; Sherratt 1986; Boyadziev 1995; Harrison and Heyd 2007; Heyd 2012; Frînculeasa et al. 2015). 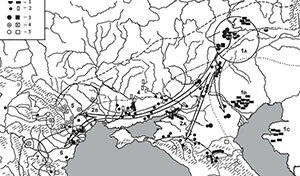 The migration stream that created these intrusive cemeteries now can be seen to have continued from eastern Hungary across the Carpathians into southern Poland, where the earliest material traits of the Corded Ware horizon appeared (Furholt 2003). Corded Ware sites appeared in Denmark by 2800–2700 BCE, probably within 100–200 years after the first Yamnaya migrants entered the lower Danube valley. This surprisingly rapid migration introduced genetic traits such as the R1a and R1b Y-chromosome haplogroups and a substantial element of ANE (Ancient North Eurasian) ancestry that remain characteristic of most northern and western Europeans today. 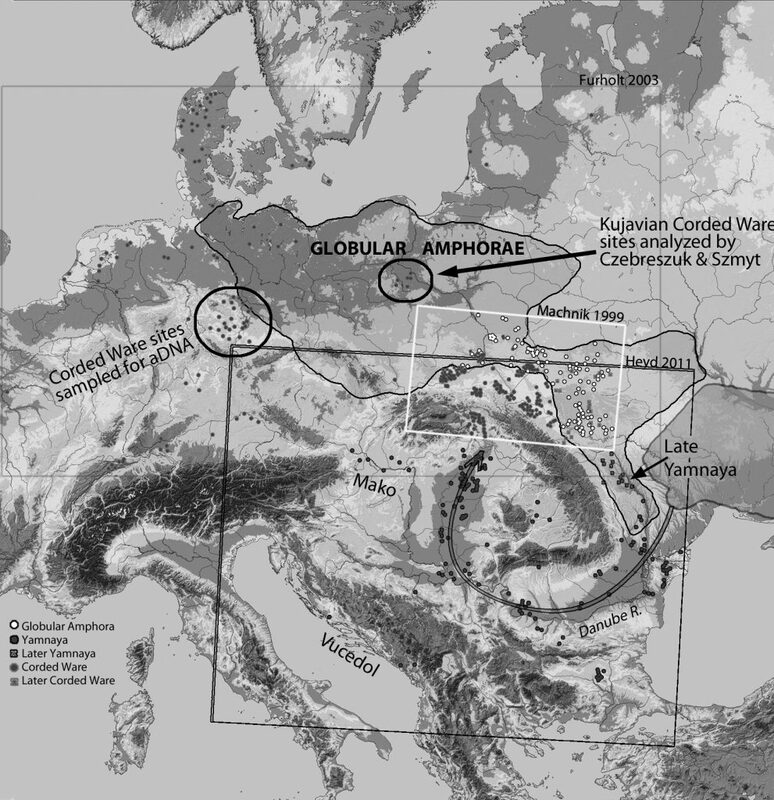 The oldest radiocarbon dates from Corded Ware sites occur in southern Poland (upper Vistula) and north-central Poland (Kujavia), and this was seen as the region where the early networking of amphorae styles from Globular Amphorae and axe types from Scandinavia began. The genetic evidence shows a somewhat different picture: the Corded Ware people were largely immigrants whose ancestors came from the steppes (probably immediately from eastern Hungary), but they quickly adopted local material traits in amphorae and axe types that obscured their foreign origins. Middle Neolithic northern European populations composed of admixed WHG/EEF survived but were largely excluded from Corded Ware cemeteries, and from marriage into the Corded Ware population. Even centuries after the initial migration the Corded Ware population at Esperstedt, dated 2500–2400 BCE, still exhibited 70–80% Yamnaya genes, although individual variations in the extent of local admixture were apparent. Intermarriage with the surviving local population was more frequent during the ensuing Bell Beaker period. However, the resurgence is more visible in mtDNA than in Y-DNA (Szécsényi-Nagy et al. 2015), suggesting that men of the older EEF heritage were disadvantaged more than women. Settlements were more permanent before the Corded Ware migration, and remained so among the Globular Amphorae people, who continued to create more localized site-and-cemetery groups in the same landscape with the more mobile immigrants. Afterward, during the Bell Beaker period, when local genetic ancestry rebounded and the population became more admixed, settlements again were more permanent. The Corded Ware culture introduced both a large, steppe-derived population and an unusually mobile form of pastoral economy that was a regional economic anomaly, but nevertheless survived in varying forms for centuries before the regional economic pattern was re-established. 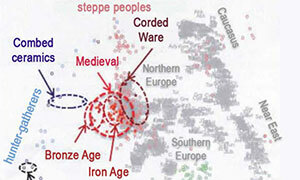 A steppe language certainly accompanied this demographic and economic shift. 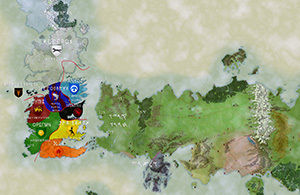 As we have seen above, there are good independent reasons (loans with Uralic and South Caucasian) to think that PIE was spoken in the steppes. It is likely that the steppe language introduced between 3000–2500 BCE was a late (post-Anatolian) form of PIE and survived and evolved into the later northern IE languages. Abandonment of the multiple cultural diffusion models from Yamna into Corded Ware, i.e. 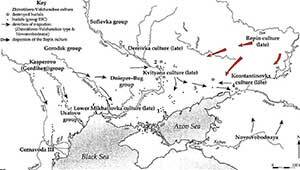 Pre-Germanic (in the Usatovo culture) and Pre-Balto-Slavic (in the Middle Dnieper culture). The only potential Yamna connection with Corded Ware in Archaeology must come from Yamna migrants in the Carpathian basin. Therefore, R1a must come from Hungarian settlements. Corded Ware cultures from Northern Europe, from roughly 2800 BC, must come from Yamna settlers of the Carpathian basin. Esperstedt is a great example of Yamnaya genes, and of the mobility (and lack of intermarriage) of Corded Ware peoples centuries, after their migration from Yamna settlers in Hungary. It is a pitty that cultural diffusion models are abandoned. They were the last hope to keep these IE-CWC/Kurgan hypotheses alive. The Carpathian Basin is obviously the only potential early connection between Corded Ware and Yamna. 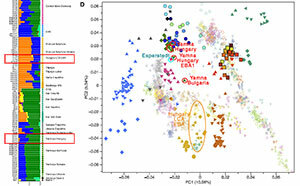 But no single R1a has been found in western migrants, and admixture (including ancestral components and PCA) from Early Yamna, West Yamna, Balkan EBA, and early Bell Beaker samples from Hungary make it very unlikely that such a connection existed. Corded Ware peoples formed and began their migration much earlier than Yamna settlers arrived in the Carpathian Basin. Compare e.g. the Late Neolithic sample from Latvia (dated ca. 2885 BC) with steppe ancestry attributed to Corded Ware, or the early appearance of east European cultures like Fatyanovo-Balanovo or Abashevo. Also, known Yamna migration routes don’t include these proposed population expansions. 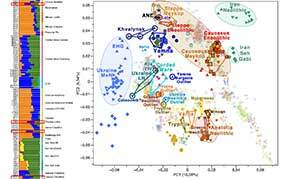 With each new genetic paper it is less and less likely that many individuals of Y-DNA haplogroup R1a, and especially R1a-Z645 (if any at all), will appear associated with Yamna, either in the Pontic-Caspian steppe or in western settlements (at least clearly belonging to Yamna, Balkan EBA, or Bell Beaker cultures), which will make the life of this new Indo-European Corded Ware Theory model still shorter than could be a priori expected for any archaeological model. 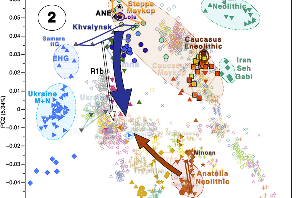 I think there is much more to be said about the interaction among Neolithic cultures from the steppe (viz. Sredni Stog and Khvalynsk), than about the Yamna migration, and Anthony was in a better position to judge this. Right now, it seems that other researchers like Rassamakin or Ivanova are taking the lead in the research of Neolithic cultures from the steppe, while Heyd or Prescott are taking the lead in the explanation of Yamna -> Bell Beaker migrations and their connection with the expansion of Late Indo-European languages. #EDIT (December 18 2017): Just to be clear, Anthony’s new Indo-European Corded Ware Theory model in Archaeology would be compatible with the development and expansion of a North-West Indo-European dialect of Late Indo-European in Linguistics (which is my main source of disagreement with other recent models). 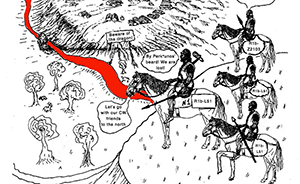 In fact, Anthony’s new model could explain the different nature of Balto-Slavic, being adopted by peoples of mainly R1a-Z645 subclades of Lesser Poland – from Yamna migrants of R1b-L23 subclades – , and later influencing Pre-Germanic brought by Bell Beakers to Scandinavia, so in that sense it could offer some light to certain controversial linguistic aspects. See Corded Ware Substrate Theory for more on Germanic and Balto-Slavic similarities based on a common, intermediate substrate.